sizes for the customers on request. of successive installation so far. BAC Compressor is a leading manufacturer and supplier of a vast array of air compressors in India. Be it domestic or industrial purposes, we are committed to fulfilling the growing need of energy resources in the form of compressed air, at the right pressure. Our journey as an air compressor manufacturer started in Coimbatore in 1979 and now we have a country-wide presence in manufacturing and supplying air compressors. The range of BAC air compressor manufacturer includes Small Portable air Compressors, Reciprocating Heavy Duty Industrial Air Compressors, Pet Bottling Air Compressor (Pet Compressor), Industrial Air Compressor, Borewell Air Compressors and Screw Air Compressors. Portable air compressor types like Oil lubricated portable compressors and Oil-free portable compressors come with a range of 0.5HP to 2.5HP. Portable air compressors are manufactured with light weight and are handy for painting and DIY (Do It Yourself) uses. BAC Reciprocating Air Compressors are made with the finest quality materials available from the top brands. Our Piston air compressor designs are unique and are capable for heavy-duty operations in the harshest of conditions. Reciprocating Air Compressor ranges from 0.5HP to 20HP and they are mostly industrial air compressors. With an aim to set footprints in agricultural industry we started manufaturing borewell compressors in India. The borewell air compressors are ideal for lifting water from deep borewells. BAC Air Compressor manufactures Borewell compressor types like Monoblock Borewell air Compressor and Single Phase Borewell air Compressor of range 1HP to 15HP. 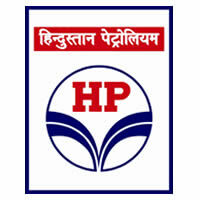 Our Pet Compressors serve many pet bottling industries in India. Pet compressors operate with 15HP and 20HP speed. Customised Pet air compressor of higher HP can be made on order basis. Pet compressors can operate up to 40bar pressure. 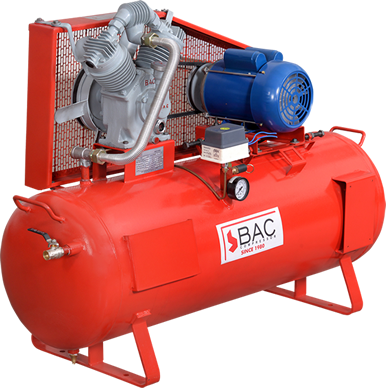 BAC has recently launched a screw air compressor for the Indian market. There are 2 different models of the screw compressor, one having fixed speed and other having variable speed. Our ranges start from 7.5HP to 60HP. 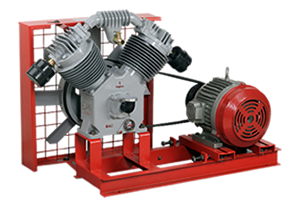 We take pride in calling ourself the leading air compressor manufacturer and supplier in Coimbatore ,India. From initial design down to the assembly, we do every aspect of air compressor manufacturing in-house. 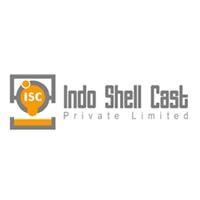 We have our own foundry, machine shop and assembly units in almost all parts of India. 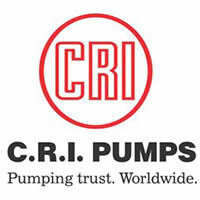 The R&D department and qualified technicians strive to manufacture and supply the prime quality air compressors in India. We operate on a large scale, providing a large array of air compressors to a variety of industries and companies in Coimbatore and across India. Alongside, we manufacture customised air compressors for domestic and small scale industrial purposes in Coimbatore and other major cities of India. Our flexible air compressor manufacturing units aim for continuous development and all the air compressors BAC manufacture in India comply with all national standards of quality and pollution control norms. We provide the comprehensive, prime quality and affordable range of air compressors in Coimbatore,India. 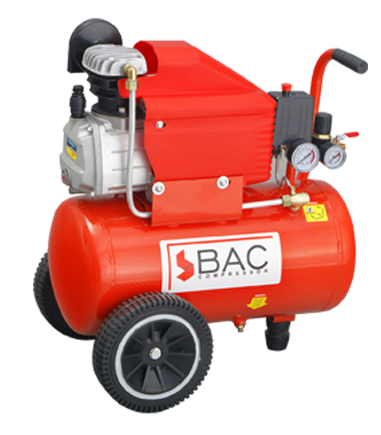 BAC is backed by hundreds of air compressor dealers all over India. 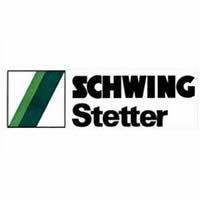 All our dealers are equipped with a through understanding of the air compressor manufacturing industry and are ready to assist our trusted customers with all the support and service they need. One of the reasons behind the reputation we have earned as the best air compressor manufacturer and supplier in Coimbatore ,India is because of our trusted dealer network. Reciprocating air compressor are commonly called as piston compressor. BAC is one of the few reciprocating air compressor manufacturers in Coimbatore that manufacturers most of its parts in-house. In a compressor more than 70% of its weight is made of Cast Iron. At BAC Compressor we make sure that we manufacture all of the Cast Iron parts compared to the other reciprocating compressor manufacturers who tend to outsource them from low quality suppliers. We ensure only the top quality reciprocating air compressor manufacturer parts make it into the assembly line to ensure proper standards are maintained.Our components meet strict tolerance parameters with the help of CNC machining centres. BAC’s Industrial air compressor manufacturers are built with two goals in mind “durability” and “efficiency”. Our industrial air compressor are a creation of over 30 years of field testing and countless design changes. Today BAC compressors have evolved along with the modern times and practices by adopting the latest techniques and processes in manufacturers of industrial compressor. 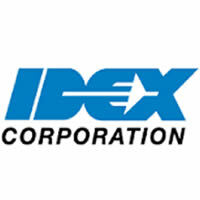 Our industrial air compressor manufacturers are unique in many ways from design perspective and efficiency perspective. Our industrial compressor stands out compared to the other competitors with uniform appearance and uniform specification.Features of industrial air compressor manufacturers involves shell moulded cylinder, heavy duty crankcase, CNC machine honed cylinder, CNC machined castings, larger cooling fan size, low maintenance cost and downtime. 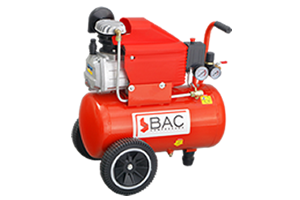 Portable air compressor are BAC’s reply to the markets demand for compressors that are small, economical, reliable, portable and easy to maintain. Portable compressor manufacturers delivers compressor in two models namely oil lubricated and oil free and also have a variety of tank sizes. Our Portable air compressors are designed specifically for people on the move. It features an outlet with a pressure regulator to adjust according to particular needs, an aluminium crankcase body to lower overall weight, cast iron cylinders for better compressor life, thermal overload protectors for the motor and a high grade plastic cover to direct airflow for cooling. A Borewell air compressor pump works by forcing compressed air into bore through a pipe. The compressed air and water mix together resulting in a mixture that is less dense than the surrounding water and therefore flows upward through the pipe.BAC made its mark in India with manufacturers of borewell compressor pumps. 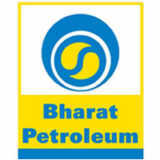 BAC has been the tier one player in borewell air compressor manufacturers in Coimbatore since decades. We have supplied to customers with depths ranging from 50 feet to 1500 feet. Unlike other borewell compressor manufacturers we have special models for the borewell segment to obtain the maximum possible efficiency. Within few years of our screw air compressor launch our compressors have already fond many satisfied owners. Our rotary screw air compressor manufacture range starts from 7.5HP to 60HP at the moment and we plan to expand our range to 100HP shortly. 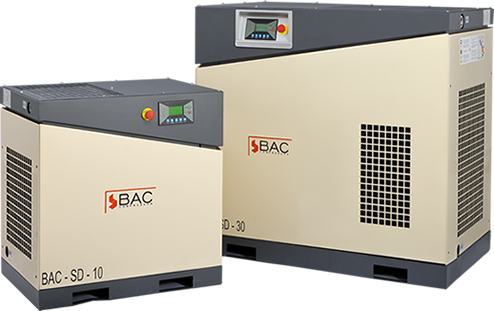 BAC provides both tank mounted screw air compressor manufacture units up to 20HP and floor mounted screw compressors manufacture from 7.5HP to 60HP. 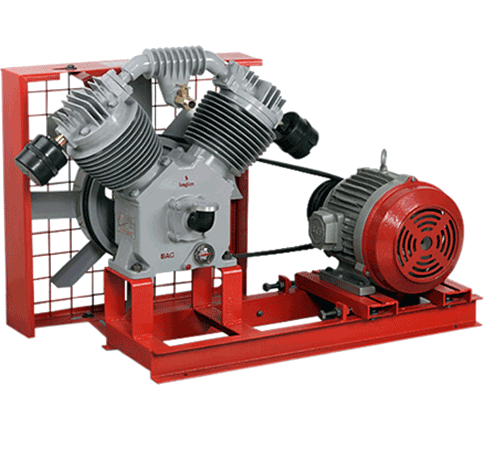 Most of the other screw air compressor manufacturers provide belt drive models which have a higher slip loss and quicker belt replacement times. On the flip side BAC screw compressor manufacture are all direct drive models and therefore have more efficient power transfer and also saves customer from recurring belt costs. BAC Compressor has come a long way since it’s inception and is one of the pioneers in air compressor manufacturing in India. We started off with a production capacity of 300 Reciprocating air compressors per annum in the year 1980; and with more than 35 years of experience in air compressor manufacturing industry, we have become one of the trusted air compressor manufacturers in Coimbatore, India. Thanks to our infrastructure upgrades and the team of technical experts, today BAC Compressors has attained stratospheric heights with a production capacity of 8000 reciprocating compressors manufactured per annum. The range of air compressors we manufacture in India have a multitude of uses at home and in businesses to make life easier. BAC Compressor is committed to attaining world-class standards in engineering excellence by bringing in superior quality air compressors. Our team of skilled professionals works constantly to improve the compressors’ energy efficiency and increase the life time of components. 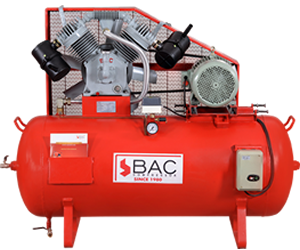 Offering a wide variety of models, BAC compressor is the best-in-quality air compressor manufacturers in Coimbatore. Not only do we manufacture air compressors, but we also have a huge supply chain of air compressors in India. Plus, our R&D team can design and manufacture air compressors according to the customers need. To be present wherever compressed air is required. 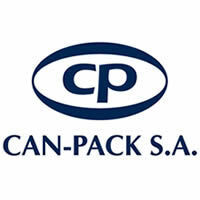 To deliver products based on the needs of our customers with good quality, at right price and good after sales service. Do you offer any warranty for BAC compressors? Yes. 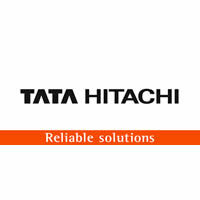 We ensure that quality is integral part of our products and hence we offer warranty to our products. To know more details, please contact our support team at: +91 – 0422 – 2971901 / 2971902, and we are happy to assist you. 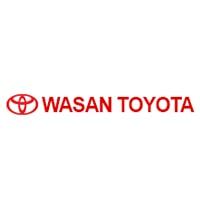 How to apply for Dealership? Kindly fill the inquiry form or call our marketing team directly. We will be happy to show you around our facilities. We advise you to give us a day’s advance notice so we can make necessary arrangements to satisfy you to the fullest. Question: Why should I buy BAC Air Compressors? BAC Compressors’s require less maintenance and down time than others. 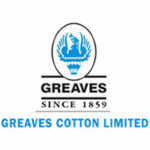 We ensure quality from end-to- end. 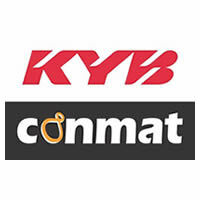 Most of the components used are produced in-house without any compromise on quality aspects. 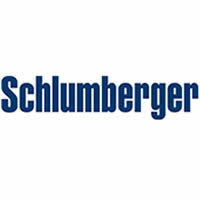 Our employees possess more than a decade long experience on an average and technically qualified. Many of our satisfied customers vouch for us. Many of our orders come from referrals. Enjoy considerable cost savings and reap better and faster ROI, as many of our customers do. Manufacturing design are unique and capable of performing heavy duty operation.Used at Machine Shops, Fabrication, Coating, Foundry, Textile and many other fields.